Think You Know Who Your Competition Is? Think Again! If you ask almost anyone in any company who they think their competitors are, they will probably name a few companies that sell similar products or services and serve the same needs as them. And these are the same companies we typically keep in mind when talking about competition in business. Ask this same question to the digital marketing team and you might hear a slightly different answer. 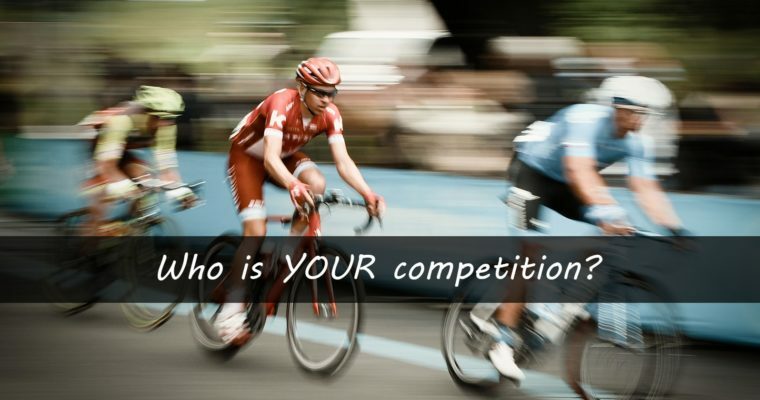 Not everyone realizes that your online competitors can be entirely different. In organic and paid search you may be competing with more than just direct competitors. This sometimes causes confusion because there is more than one kind of competition. 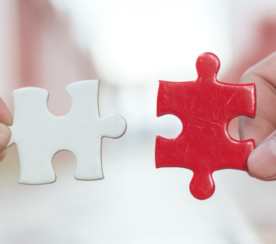 Let’s take a look at the different ways we compete in SEO and PPC. In the online world it’s search engines – not customers – that decide which websites get the most organic visibility. You can have the most relevant website for a keyword. But if it isn’t optimized properly it’s unlikely to get lots of organic traffic. As SEO professionals, we’re forced to compete with those whose content fit the search engines’ idea of what the best content for a keyword is. Don’t get me wrong, Google and other search engines are getting exceptionally good at ranking content based on intent. This will only continue to improve. And that’s a good thing. But that means that sometimes you need to compete with brands or businesses that also want to be found for keywords you want to rank for – even though they aren’t necessarily your direct competitors. Let’s take a look at a few most common SEO competitor types that your product and service pages might be competing with. Google sometimes prioritizes lists over vendor content. For example, if you’re promoting a conference you might find your conference competing with a blog post about “10 Top Conferences to Attend in 2017”. How can you overcome that? Try creating a bigger and better list and include your own conference. You can give the blog readers a special rate to attend your conference to make it stand out. Alternatively, you can add more content to your conference website to indicate to search engines that yours is the best content for the keyword. Sometimes search engines prefer to give users multiple vendor options to choose from. As a result, directories like Homestars (for contractors), Capterra (for software), Yelp (for local businesses), and TripAdvisor (for travel and hospitality) results appear on first ranking positions and users seem to love it. Otherwise, search engines would stop doing that. The best thing you can do is to have listings in those directories and make sure that you have the best and most reviews and appear at the top of the first page. That way when a user explores their options, they can still easily find you. If you’re trying to rank your product page for a keyword and notice that an article or multiple articles are outranking it, ask yourself what the main intent of the keyword is. If it is more of an informational query, see if you can satisfy this need by including additional content to your page to provide users with what they are looking for. If, on the other hand, the intent behind the query is more transnational, try to understand why the articles are outranking your product page, which is objectively more appropriate. It could be that its on-page elements are better optimized or it simply has more backlinks pointing to it. Or it could also be that the search engine is testing the content to see if people would click on a blog article when searching for this particular keyword. 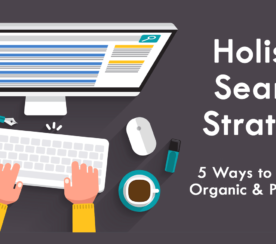 As a rule of thumb, if you are trying to understand why a certain page or a website is outranking you in organic results, closely examine their SEO strategy. Are their H1 and title tags more descriptive? Does their page load super fast? Do they provide outstanding content that answers many questions users might have? Do they have lots of links pointing to their website? 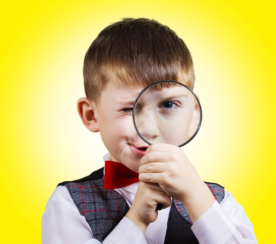 Once you identify those gaps, you can optimize your page better and outrank them. 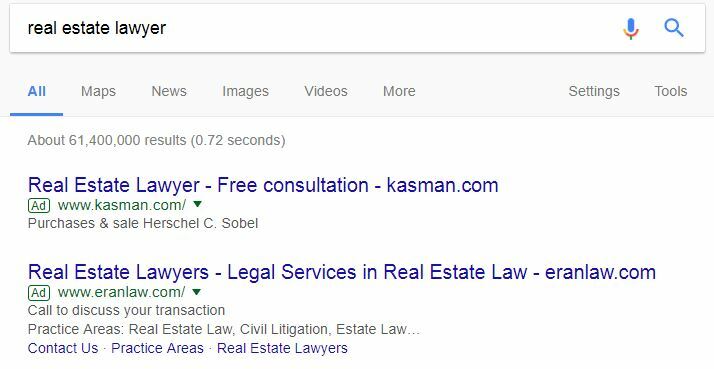 Unlike SEO, in paid advertising you have a little bit more control around how high you wish to appear in search results. The only issue is that, depending on the keyword, sometimes you need lots of money to appear in the top positions. In this particular case let’s talk about Google AdWords since it’s the most popular paid search advertising platform. This is pretty straightforward. You have direct competitors that invest money into Google AdWords and bid on the same keywords as you. If you wish to outrank them you need to either bid higher or optimize your campaigns to make sure your quality score is better and, therefore, you are paying less to stay in top positions. A situation where your competitors are the same in AdWords and in real life. This one can be a little less straightforward. An example of different types of companies competing for the same keyword in Google AdWords. 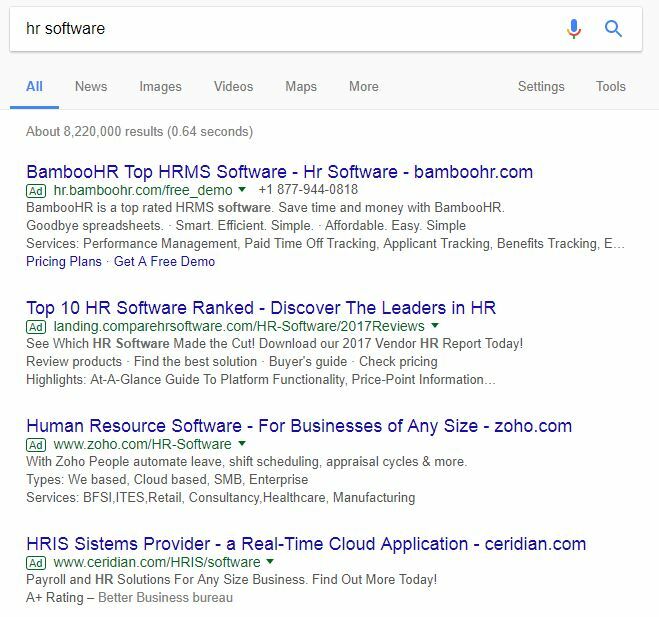 All four ads appear on a search for [hr software]. Out of the four, only Zoho and BambooHR seem like they have somewhat similar products and might be competing in real life. Ceridian is a payroll software and probably gets purchased in addition to Zoho or BambooHR, bur doesn’t compete directly. CompareHRSoftware.com is a website that lists various HR software vendors and compares them. It’s not an actual competitor to any of the above companies, but it bids on same keywords as them in Google AdWords. If you find yourself in a situation like this, one thing you can do is closely monitor these keywords. Do they perform at all? Do they convert visitors into customers? Does it make sense to bid on them or do people who search for these keywords are interested in somewhat different products? If you have decided that you must bid on these keywords, make sure the copy of your ads clearly states what you are offering and hope only those who are interested in your specific product will click. Otherwise, you might be losing lots of budget to irrelevant searches. In the example above, it’s not obvious that Ceridian specializes in payroll software. If I’m looking for performance management software (like Zoho or BambooHR), I’m still going click on Ceridian link, because there is nothing indicating what exactly their software does. As a result, they will have some wasted budget, and possibly, a lower quality score. Sometimes you might see random ads appearing for your keywords. Guess what? Even though they might be completely irrelevant and they most likely don’t get any business from these keywords they are still your competitors. Depending on how much their bid is they might be pushing your ads to the bottom of the page or to page two where they get much fewer views. None of the search results match the keyword. 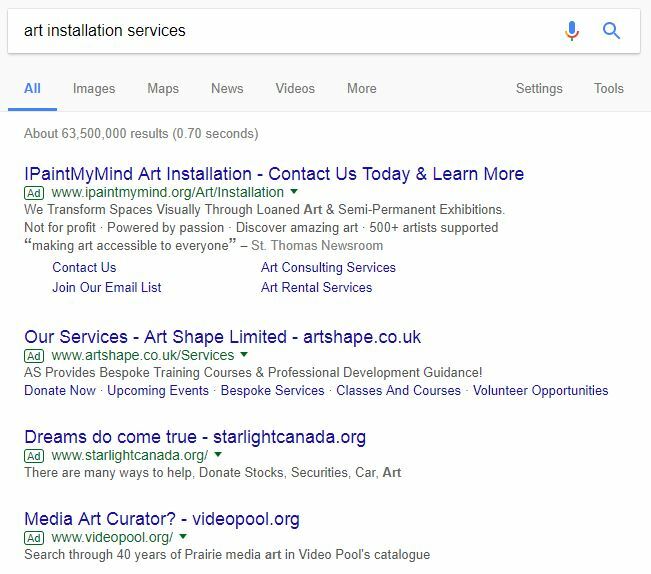 The company from the first result does actually install art. But it seems like they specialize in art rentals and would only install the art you rented from them. The second one is an ad for a course on creative development and has little to do with the keyword. The third result is a nonprofit children foundation looking for donations. Finally, the fourth result is the vault storing video. If I was actually looking for somebody to come in and install my art, none of these options would suffice. It’s hard to say why exactly their ads appeared for this keyword. It could be that the keyword match types are too broad or there are not enough negative keywords added to campaigns. Either way, if you’re trying to advertise your art installation services you can’t ignore those vendors and the fact that they might be outbidding you. Your best bet would be to make sure you keep your quality score as high as possible and don’t overpay for the keywords. Sometimes we focus all of our time on real world competitors and forget that there is more competition happening on multiple fronts in the online world. It’s a good practice to always keep these secondary competitors in check, especially if you want to get higher organic rankings and run more effective paid campaigns. All screenshots by Katya Bovykina. Taken August 2017.